Famous For: Horton Hears a Who!, The Cat in the Hat, How the Grinch Stole Christmas! The work of Dr. Seuss can be described as cleverly spiced up catchy rhymes, imaginative characters, and brilliant illustrations that mimic the environment in which he was brought up. But as the prefix to his name suggests that he was a qualified physician, he never was. It was just a crafty way to lend credibility to his artistic characters. 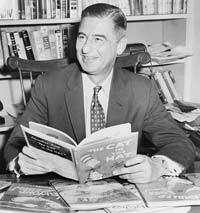 Theodor Seuss Geisel was born in Springfield, Massachusetts, to Theodor Robert and Henrietta Seuss Geisel. His mom is always credited for the rhymes Seuss had used all over his books and she was also well known for driving children into sleep with her relaxing chants. Although Dr. Seuss was born into a wealthy family, the situation was offset by the commencement of World War I that presented hard economic times for the German immigrants. He later joined Oxford University to accomplish his father’s wish of becoming a university professor. While there he encountered Helen Palmer, whom he married in 1927 – the same year he dropped out of school. The couple moved back to the United States and Geisel decided to do full-time cartooning. Most of his articles and illustrations were published in Vanity Fair and Life magazine. He later joined Standard Oil Company in the advertising department and spent over 15 years there. He even became famous for a commercial advert on Flit insecticide. During this time, he came up with his first book, And to Think That I saw It on Mulberry Street, which was rejected 27 times before a final acceptance by Vanguard Press in 1937. His love for artwork saw him issue political cartoons every week in the PM magazine. As World War II materialized, Seuss felt the urge to contribute to the raging effort apart from the skillful illustrations he had. He settled in Hollywood to do animation for Capra’s army unit and was once rescued from the line of fire when presenting his animated works to the generals. After the war, the Geisel were working for Life magazine and took trips to Japan to further explore diverse cultures. In the years following WWII, Dr. Seuss worked far and deep in children’s books. It was during this time when he wrote classics such as If I Ran the Zoo (1950), Horton Hears a Who (1955), and potentially his most well-known children’s book, 1957’s The Cat in the Hat. He followed these up with How the Grinch Stole Christmas, Green Eggs and Ham, and many more. Geisel married Audrey Stone Diamond after his wife passed away in 1967. He continually produced films and books every other year until his death on September 24, 1991, in La Jolla, California.